So now that we've all survived NYCC, what are people's thoughts? What did you think of the crowds this year? What was your favorite cosplay? Did you get to see the Hulkbuster? :) Do you have awesome photos? It was a fine enough show. The crowds seemed worst than last year, at least when comparing Thurs/Fri. Artist Alley remains the best thing about NYCC, although some of the programming was also outstanding as well. Cosplay wise, there was a ton of cool stuff, but what took the cake was a Father/Daughter Saga combo, because baby Hazel is precious. I thought the crowds seemed bigger this year too, particularly on Thursday. I don't usually do a whole lot of booth hopping in artist alley. I like going there to get pictures of cosplayers without that crazy red carpet, but I don't tend to have much desire to buy prints or commissions because I'm not really sure what I'd do with them. Did you happen to get pictures of that Saga combo? I don't think I saw them, and I LOVE Saga. [QUOTE=djlemma;5000391]I thought the crowds seemed bigger this year too, particularly on Thursday. I think more ppl were in the vendor's hall on Thursday trying to sang exclusives. Those POPs line were cray. My wife snagged a photo, so I can toss it up here when I get home tonight. It wasn't quite as magical as last year, but it was still great. So many new League of Legends cosplayer friends. :D I did see the Hulkbuster, and it was amazing. Did you guys see my friend in the DJ Sona costume? [QUOTE=Saltpeter;5000438]It wasn't quite as magical as last year, but it was still great. So many new League of Legends cosplayer friends. :D I did see the Hulkbuster, and it was amazing. Did you guys see my friend in the DJ Sona costume? If so I was just chatting with my friend Emma about you. :) If you guys feel like getting in costume again for a photo shoot let me know and I'll grab my camera. That DJ Sona costume was pretty unreal, I am surprised there aren't tons more photos of it. Yeah, I am. :D If Emma is Eebee, then she contacted me on LoL about your photos. :D I will totally let my friends know about your offer. :D They'll probably be down for it. Most of them live in New Jersey, so they might not be able to do a shoot unless it's in NJ. I can drive there myself. The lack of DJ Sona pics IS troubling. D: I was expecting her to get waaaay more attention. She did get into a ton of serious photoshoots though. Pics will probably stream in after editing. [QUOTE=Saltpeter;5000459]Yeah, I am. :D If Emma is Eebee, then she contacted me on LoL about your photos. :D I will totally let my friends know about your offer. :D They'll probably be down for it. Most of them live in New Jersey, so they might not be able to do a shoot unless it's in NJ. I can drive there myself. Eebee, yep. I have a motorcycle and a pretty portable setup, if there'sa good location in Jersey to shoot. I know I've seen some other shots on people's albums, I'll link you as I find them. [QUOTE=djlemma;5000167]So now that we've all survived NYCC, what are people's thoughts? What did you think of the crowds this year? What was your favorite cosplay? Did you get to see the Hulkbuster? :) Do you have awesome photos? Pretty busy, but this was my first year so not much to compare to. A lot of really well-put together cosplays, and seeing the Hulkbuster take the gold ring during the Cosplay championship was pretty awesome. That's hard though, because I thought all of the finalists did a stunning job with each of their cosplays. The other thing, which shouldn't surprise me but always does, is how gracious and nice everyone in costume was. At its best, the community is everything one would hope it to be, which was really awesome. I had a first time cosplayer with me as Poison Ivy (a 50's pinup version, flared skirt and victory rolls!) and she was really, really nervous. And the community came through, so I think we have another convert! 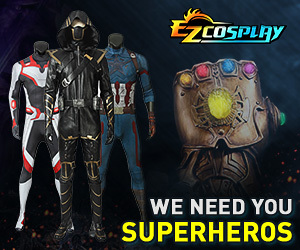 Hey dj, my League cosplayer friends want to know if you have a page, something they can look at. I used to have a crappy web site, but it was costing $100/year and I wasn't keeping up with it. Right now I am just uploading stuff onto flickr. Here's the 3 albums I have up so far, about to upload my Sunday photos but they aren't quite ready. It's at least all the photos I edited up. I have more. If anybody finds themselves in the albums (Or knows people, or can ID some of the character I didn't know) be in touch. I guess it can be the photodump thread. Why not? Doesn't seem to be a lot of activity though. Are there other sites people go to for posting photos? I've posted on reddit, and tried tagging the heck out of links on twitter and flickr... not sure how much good it's doing. Also, nice photos as always!